Ukraine is a sovereign state with its own territory and its bodies of state power and governments. It also has national emblem: state flag and anthem. Ukraine proclaimed its independence in August 24, 1991 and confirmed this status on December 1-st of the same year. The country is situated in the south-eastern part of Central Europe. It covers the area of 604,000 square kilometres. The territory of Ukraine consists of the Autonomy Republic of Crimea and 24 regions. Ukraine is inhabited by people belonging to more than 110 ethnic groups. The population of Ukraine is nearly 50 million people. It borders on Poland, Slovakia and Hungary in the west and on Romania and Moldova in the southwest. It's northern neighbour is Byelarus and the eastern one is Russia. The territory of Ukraine is mostly flat and mountains make up only 5% of its territory (there are the Carpathian mountains in the west and the Crimean mountains in the south). The climate of Ukraine is moderate. The main rivers of Ukraine are the Dnipro, the Dnister, the Buh and Donets and others! The Dnipro is the main river in the country. It's one of the longest rivers in the world. Ukraine is washed by the Black Sea and the sea of Azov and has such important ports as Odesa, Mariupol, Mykolaiv, Kherson. The geographical position of Ukraine is favourable, because the country lies, on the crossroad of the ways from Asia to Europe. Like any other country in the world Ukraine has big cities; among them are Kyiv, the capital of Ukraine; Kharkiv, which used to be the capital of Ukraine and now it's an important industrial and cultural centre; Donetsk is a coal-mining and chemical centre; Odesa is a big sea-port; Lviv is a large scientific and cultural centre and a lot of others. Due to favourable climatic conditions, Ukraine is traditionally an agricultural country. Wheat and corns, all kinds of fruit are grown here. The country is rich in national resources, such as iron ore, coal, gas. It produces planes and ships, lorries and buses, TV and radio-sets and other goods. The climate of Ukraine is moderate. Summer is hot and dry with occasional rains and thunderstorms. Winter is rather mild without severe frosts but with snowfalls everywhere. The rivers and lakes freeze in winter. 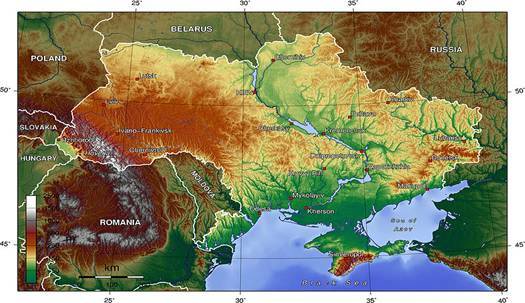 Ukraine is rather a big country, that's why its climate is different in various regions of it. Of course, the hottest region is in the South. In the central part of the country the climate is moderate and continental. The climate on the territory along the Black Sea and the Sea of Azov is warmer. The Crimean and the Carpathian mountains protect the country from winds. The coldest part is that in the North and in the North-east. And now let's characterize every season of the year in our country in general. Autumn is warm at the beginning but later it gets colder, it often rains. Winter sets in December with its cold and heavy snowfalls and winds. The average temperature is about 15 – 20 degrees below zero. But it often happens that winters are mild and rainy and this is the most unpleasant time. In spring the weather is changeable. It may be cold and windy, sunny and rainy on one and the same day. In summer the weather is usually warm, sometimes hot and dry. The temperature is about 20 – 30 degrees above zero. The warmest months are July and August. They say the climate in Ukraine like anywhere else, is getting milder with every coming year. In the last few years all the scientists agree that something very serious is happening to the climate and weather of Ukraine and the whole world. It depends on many reasons. Kyiv is the capital of Ukraine. It has a long history. And this makes Kyiv stand out among other cities. In 1982 it's 1.500th anniversary was celebrated in the country. It was called «The Mother of All Russian Cities». Kyiv bears the name of prince Kyi. Kyiv is the seat of the Supreme Court and Cabinet of Ministers. It's population is about 3 million. Kyiv occupies an area of 790 square kilometres. The city lies on both banks of the Dnipro. Kyiv is the largest centre of national culture. A lot of concert-halls, fifteen museums, palaces of culture, film studios, the circus make Kyiv a large cultural centre in Ukraine. The Kyiv Shevchenko opera and Ballet house, the Kyiv Franko Drama Theatre are well-known all over the world. Museum of Books and Book Printing, museums devoted to dramatic and film art, memorial museums devoted to outstanding personalities are situated in Kyiv. Kyiv is also one of the biggest scientific centres. The Ukrainian Academy of Sciences and many research institutes are famous for its discoveries. More than 10000 students study at the Shevchenko National University. There are over 20 higher educational establishments in Kyiv. Kyiv is famous for its beauty, for its wonderful broad avenues, lots of chestnut trees and flowers all over the city. A remarkable feature of our time is that people travel a lot. Those who are fond of visiting historical and cultural places usually dwell their choice on ancient cities. The older the city is the more places of interest it has. That's why Kyiv is quite an interesting place from this view point. Tourists are attracted by numerous places of interest in Kyiv. They are Kyivo-Pecherska Lavra, St. Sophia's Cathedral, the Golden Gate, the monuments to T.G. Shevchenko, the great poet of Ukraine, to Bohdan Khmelnytsky and Prince Volodymyr. Kyiv has a well-develops industry. Its factories and plants produce sea and river transport vessels, air liners, computers, motorcycles, consumer goods. As each country in the world Ukraine is rich in its national traditions. Some of them are common in the world and some of them are uncommon. Firs of all we celebrate our Independence Day on the 24-th of August. To my mind, this holiday is young because my country as an independent one is very young too. It's only eleven years old. But in future, I think, it will be a big holiday. I'd like to tell you about some old traditions in my country. They are Easter and Christmas. My people began to celebrate these holidays since the baptizing of Kyivska Rus in 988 by Prince Volodymyr. We celebrate Easter in spring, according to the Julian calendar that's why it doesn't coinside with the western world. This holiday is always in April or at the beginning of May. Eastern symbolizes the Resurrection of Jesus Christ. Every body makes cakes so called pasha and dye eggs. Easter cakes are sold at every bakery, but home-made ones are always much tastier. All the provision must be baptized in the church early in the morning. Another holiday is Christmas. We mark it on the 7-th of January. In Europe and in the USA it's celebrated in December. On Christmas people celebrate the birth of Jesus Christ. There are some dates and events in the life of our country that are memorable to every Ukrainian citizen. The most memorable date is the Victory Day which is kept on the 9th of May. On this day the anniversary of the victory over fascist in Second World War is celebrated. There is one more holiday which is loved by children and adults. This is New Year's Eve. People decorate New year trees with toys and lights and all the people are given presents. On the New Year night people don't sleep, they visit their friends or just stay at home and watch TV. These are national holidays, people don't work on these days. As for me, I like to celebrate these days! The national cuisine reflects the richness of traditions and folkways of Ukrainian people. The most popular and well-known Ukrainian dish is surely borshch, an aromatic and appetizing cabbage-soup of some 20 ingredients. It may be cooked with beef, chicken or pork, baked beets, beans and mushrooms. Borshch is served as the main course with pampushki, soft rolls soaked in garlic. Traditional in the Ukrainian menu are varenyky, a type of boiled dumplings with various fillings (cherries, strawberries, fried mushrooms, curd, chopped liver, etc.) and golubtsy - cabbage rolls stuffed with minced meat. In Ukrainian cuisine has a variety of dairy meal as well as sweet pastry, including doughnuts, cakes and other cookies. The proud of Ukrainian people is wheat bread, sweet-smelling and light. If you have an occasion to be at the Ukrainian home, you will be charmed by the sincere warmth of hosts and homemade food. Ukraine is a country with the rich past. It is rich for historical monuments and different places of interest. Kyiv, the capital of Ukraine, is one of the oldest cities in the Eastern Europe. That's why it is not surprising that a lot of interesting monuments are situated there. For example, the well-known to all Slavonic world St. Sophia's Cathedral and Kyivo-Pecherska Lavra. But Ukraine is not only Kyiv. There is also Western Ukraine with the Carpathians with their legends and with their unique nature and culture. One may visit the famous symbol of the Crimea – the castle “Swallow's nest” or the residence of Russian tsars in Livadia. It is also possible to visit the last house of Chekhov, now the museum in Jalta. There Chekhov lived and wrote his last works. It is possible to go through Gogol places in Poltava region, see Dickanka, Sorochintsy. One may also go to Zaporizhzhia, to the island of Кhortytsya. There the Ukrainian cossack's organization was born. One can go to Odesa and walk along the boulevards, where Pushkin walked a long time ago and touch the trees, which Pushkin touched. Near the small town of the Kaniv the monument to the Ukrainian national genius Taras Shevchenko is situated. The museum, where the books, drawing and manuscripts of Shevchenko are kept, is situated in the village not far from Kaniv. Even the house, where he was born, is preserved. It is very interesting to look at it. One may come to Poltava, visit the museum of the famous Poltava battle, the field where Petro the Great defeated the Swedes. There is a lot to see in Ukraine and to be proud of. And I am glad to live in such a country, with all these beautiful monuments. Ukraine has got father developed system of education. General secondary education is free and compulsory. There are many gymnasiums, lycees and private schools in Ukraine. The secondary school must secure a uniform level of knowledge necessary for each student. Post-secondary education is provided by technical schools, colleges and institution of higher learning: universities, academies and institutes. At each institute or university there are is a post-graduate course with postgraduates working for their scientific degrees. There are many scientific educational and academic centres in Ukraine. Kyiv with its famous National University named after T. Shevchenko, Polytechnic University, Kyivo-Mohylyanska Academy which resumed its work in 1991. There are three faculties in the Academy now: the humanities, social and national sciences. Lviv is the leading scientific and cultural centre of Western Ukraine. It has a number of research institutes of high level. Kharkiv University has 10 faculties: mechanics-mathematics, physics, physics-technology, radio-physics, chemistry, biology, economics, history, philology and foreign languages. Ukraine numbers a total of 1.5 million college and university students. Graduates from the Ukrainian institution of higher learning become famous writers, prominent diplomats, economists, chemists, mathematicians and others. Nowadays much attention is paid to our youth. The desire of our young people to become qualified specialists in future motivates them to enter higher educational establishments. Higher education for young people nowadays is the method of developing their talents and abilities, their creative potential. That's why beside their studies they are also engaged in different clubs and organizations. A lot of young people go in for sports. That is why schools and institutes have sport clubs and teams. Our young people are especially interested in football, basketball, hockey etc. There also exists a great variety of different clubs in this country. Future belongs to the youth. Many young people are engaged in political parties and organizations such as «the greens», the Union of Ukrainian Youth and others. Almost every school or institute has its own team of joyful and smart (KVN). This game is rather popular among our young people and it helps them to bring out their brightest talents and to create team spirit. Young people learn to share the moments of luck and failure, to work together. Beside studies young people are also engaged in scientific and research work. Nowadays this sphere is not paid too muchattention. There also exists the Ukrainian branch of youth organization Greenpeace in Ukraine. This organization protests against environmental pollution, against murder of all animals. Young people learn to love their land and the world that surrounds them. The protection of nature has become one of the most burning problems of the 21st century. The Earth provides people with mineral resources, rivers, forests, fields — everything that makes the foundation of industrial and agricultural production. Why does all this want protection? Because people often do things which pollute land and waters greatly. It's very dangerous because it damages health of the people. There are a lot of industrial enterprises in our country, that's why we can't ignore the problem of the protection of our environment. Our plants and factories put their wastematerials into water and atmosphere and pollute the environment. There are many kinds of transport in our big cities, that's why we must pay attention to the protection of our nature and the health of people. The accident at the Chornobyl nuclear power plant in April 1986 caused radioactive contamination of a vast area around plant. More than 100 000 Ukrainian citizens were evacuated from the city of Chornobyl and other areas around the reactor site. The other problem is an earthquakes. We know some terrible earthquakes in Armenia. Our scientists try to forecast earthquakes, then we can protect ourselves from them. Not only people but the nature is ill too. Millions of years ago animals lived on land, there were lots of trees on the Earth. But now trees as well as the animal world are in danger. They are killed by polluted air and acid rains. Tons of smoke and gas are emitted into the air. But unfortunately very little is being done to save them. If the trees die, we shall die too, because they supply us with oxygen to breathe. Environmental protection is a great concern of the Ukrainian Government. The Ministry of Environment Protection was founded in Ukraine. Their tasks are to control the state of environment and sources of pollution, to protect the water resources of Ukraine, to extend the network of mature reserves and to maintain with international ecological organizations. The Ukrainian Green Party is very active today. «Zeleny Svit» is the Ukrainian ecological newspaper. It calls on people to protect the nature and to use it in a more careful and economical manner for the benefit of the present and future generations. Our Earth is our home. I think people must take care of our Motherland. Now Ukraine is a sovereign state. Ukraine is one of the members of the United Nations Organization and participates in the work of many international organizations. We have wide relations with Canada, the USA and Great Britain. Foreign Embassies of these countries work in Kyiv. Scientific cooperation is also very important. Cooperations in culture, education and sport are very important too. We exchange students and teachers with Canada and the USA. The Ukrainian orchestras, pop and opera singers, ballet dancers are warmly received. A lot of tourists from English-speaking countries visit Ukraine every year. We have some joint political projects with the United States of America and Canada. Such big plants of ours as Cherkasy joint-stock company «Azot», «Gorlovka» chemical plant «Stirol» sell their products at international market. I'd like to say that many people who are Ukrainian by origin live in Canada. Many of the Ukrainians living now in Canada and other English-speaking countries don't lose connections with Ukraine. A lot of public organizations, educational establishments, religious organizations make considerable contribution to the development of our culture, literature and art. By the by, Canada was the first among the western states that recognized the state independence of Ukraine. 1. Petrenkko L. B. “Kyiv: Ancient and always young”. – Kyiv: “Aspect – Poligraph”, 2006. 2. Godunov A. B. “Short history of Ukraine: From the most ancient times to our days”. – Moscow, 1987. 3. Bogush "Manual on history of Ukraine". – Lviv, 1997. 4. Meshkov V. M. “Kyiv everlasting ”. – Kyiv, 1998. 5. Golovatenko "History of Ukraine: problems are debatable". – Kyiv, 2000. 6. Butromeev "Ukrainian history for all".